The nose wheel tire is flat as a pancake. Again. I sigh. Then curse. This is my third time at this particular rodeo. Now, for background, there are actually a handful of maintenance items that pilots are allowed to do, and don’t require a licensed airplane mechanic. For instance, a pilot can change a light blub in an airplane. And a pilot can replace a defective cotter pin. A pilot can also add hydraulic fluid to the reservoir. A pilot can change the battery. And that’s about it. Of course to do so, it helps to know what you’re doing, which I didn’t. But with my mechanic’s advice, some creativity, the deployment of a lot of Anglo Saxon English, and with much struggle and lots more grease, Rio—whom I took out of school for the day to help me—and I got the job done, and we drove the removed wheel to Santa Fe for a new tube. While I had faith I that could successfully remove the wheel, and get it back on again, I had no particular faith that I could remove the bad tire and tube and put a new one on the wheel. I’ve watched through the windows at the tire shop when I’ve bought new tires for my car. These types of operations require the right equipment and the right know-how. I have neither. My confidence in my potential for doing that part of the job was not increased by watching my mechanic put the new tube in later that day. Besides, I thought, how often could something like this possibly happen? The second time we had a flat nose wheel, we were on our way to the AirVenture Cup and we were severely pressed for time. My mechanic offered to make a house call. He and his dog flew over from his airport to our airport and he got us fixed up right away in our own hangar. And now, not even a year later, I’m squatting on the ground next to yet another crumpled pile of rubber. I attach my compressor to the stem of the flat tire and flip on the switch. 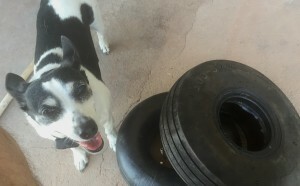 In no time, I’m at 18 pounds psi on the little tire. I get out the bottle of soapy water and spray the stem. No dice. No simple fix of a loose stem valve. We’ve got a real leak in the inner tube and I’ve got three choices: Remove the nose wheel and take it in for repair—a four hour round trip drive; request a house call; or air up the tire to the max and fly the plane to my mechanic, betting that the tire won’t go completely flat during the one-hour flight. I immediately reject option three as unnecessarily risky. Oh. Right. I have a fourth (theoretical) choice: I could put a new tire on the wheel myself, if I had one. Naturally, I decide to take the wheel to Santa Fe. I lay a soft towel over the horizontal stabilizer of Tessie’s tail and heft three heavy bags of landscaping rock up on top of it. This shifts the center of gravity backwards, offsetting the weight of the engine, and like a child’s teeter-totter, Tess rocks smoothly back and forth on her main gear with the touch of a finger. This is how airplanes are jacked up to change their nose wheels, although I’m told that the pros use cases of oil instead of landscaping rock. 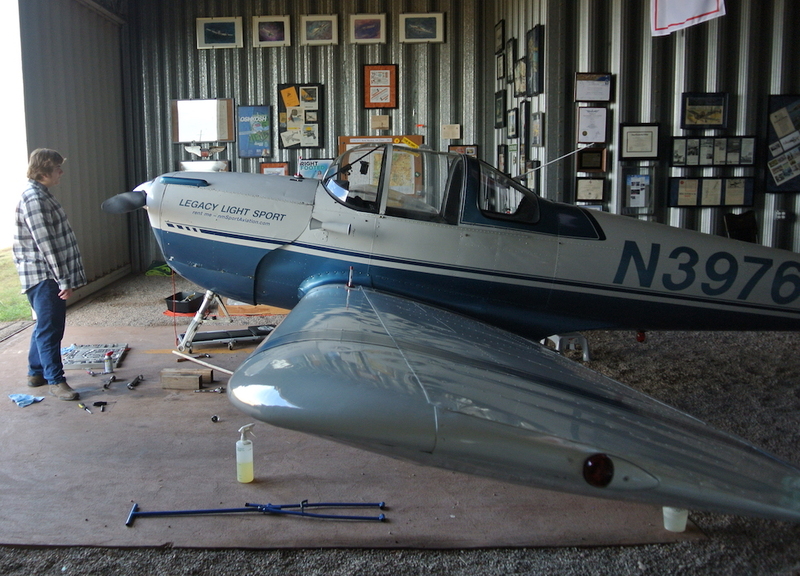 I settle myself onto the oil-stained concrete floor of the hangar and struggle with the screws that hold the nose pant in place, then start loosening the bolts that hold the axle. My hands become coated with a slick layer of black grease as I remove the various parts. It’s taking longer than I remembered, and I’m not looking forward to the long drive over to Santa Fe and back to the hangar, where I’ll have to reverse the whole process. That’s when it occurs to me: If this were a car, I’d be putting on the spare right now. Actually if it were a car I’d be calling AAA rather than getting my hands dirty. After all, that’s what I pay them for. But you get my drift. I decide right then and there that I’m going to buy a spare nose wheel and have it mounted with a new tire and tube. For future flats, I’ll just do a quick change and be on my way. Of course, having a spare wheel will change the course of the universe entirely, because being fully prepared for a quick change, I’ll never have a flat nose gear tire again in my life. At least, that was what I decided until I saw the price of a new nose wheel. For most planes, a nose wheel runs a few hundred bucks. For whatever reason, for mine, it’s fully two thousand dollars. If an ounce of prevention buys a pound of cure, how much cure do I get for 2K? I look into my empty wallet and change my mind. I think I can learn to put a stupid tire on the damn wheel. For Sale: Five year old Air Race. Nice time of year. Mild climate. Good location at large airport. Held during major air event. Viewed by over 200,000 attendees. For more information, call Craig Payne at Sun ‘n Fun. OK. So I totally made up that classified ad. But what it’s selling is totally real, and you can buy it tomorrow, if you want. 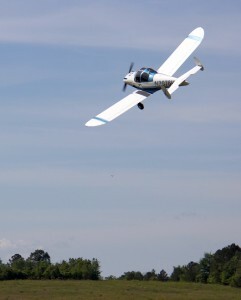 The Sun 40 Sprint—an aircraft speed trial that actually launches out of, and finishes at, Sun ‘n Fun’s Lakeland Linder Regional Airport during the expo’s daily showcase—has been re-classified by the expo’s brass as a “sponsorable” event. That means you can buy your very own air race. Which is not as crazy as it sounds. Let’s suppose you own a small company that has a great aviation product that you want to sell to pilots. You’ve got your website ready to go and your inventory is just begging to be shipped. Now all you have to do is get the word out. Sure, you have a Facebook page, but like us here at Plane Tales, you only have 32 “likes.” (And we love every one of you.) So you need to advertise. The traditional approach would be to buy an ad in one of the aviation magazines, but this is not for the faint of pocketbook, and certainly not for the bootstrapper. For instance, a 1/6 page black and white ad in AOPA’s Pilot magazine costs $3,080—and everyone who knows anything about magazine advertising knows you need to be seen again, again, and again. For a two-color ad the rate jumps to nearly four thousand bucks. Want a color photo in your ad? Cha-Ching. $4,840 at the cash register, please. So what about a booth at one of the aviation expos instead? Sun ‘n Fun would actually be a good place to start. It’s neither as expensive nor as overwhelming as AirVenture, but it’s a huge leg up over a local airshow or fly-in. The annual Florida event draws nearly a quarter million aviation enthusiasts from all over the country who are in a nice warm location following a cold winter back home, and they are ready to take to the skies again with their hearts and wallets. How much would a booth at Sun ‘n Fun set you back? Looking at this year’s rates, the cheapest outdoor booths are $1,390. That price includes six exhibitor badges and one parking space. If you want to be indoors, the rate is $2,350. If you need internet, it will be more. Of course, larger booths and premium locations command yet higher rates. Still, it sounds like a deal and a half, huh? Hell, it’s cheaper than the stupid magazine ad. Or is it? Because that’s just the cost of the empty booth. You’ll still need signs, display materials, and tradeshow giveaways. And that’s just the beginning. The show runs the better part of a week. You’ll need to pay for hotel, rental car, and food. And unless you have amazing stamina, you’ll need help. And you have to get there, too. This is why some companies choose to have a remote presence instead. Ben Sclair, publisher of Sun ‘n Fun Today (the show’s daily newspaper) told me that some companies find it cheaper and just as effective to advertise in his paper to reach the attendees, rather than to take on all the costs of coming in person. Or you could buy the air show. Even I gotta admit that the Plane Tales Sprint has a nice ring to it. 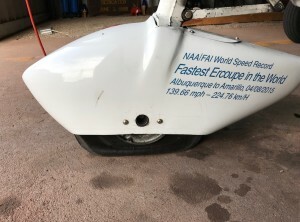 I’m sure the details are negotiable, but Payne tells me he’s looking to find someone to sponsor next year’s show for around three thousand dollars. Where would your money go? To trophies and food for the racers, and to help support the event and Sun ‘n Fun’s educational mission. What would you get for your money? Well, you’d get your name out in a big way. It would be in all the adverting, all the media coverage, and if you went to Sun ‘n Fun yourself, you’d hear your company’s name again and again during the hour-long event, which is covered live by an announcer just like a baseball game. If I had something to sell other than words, I’d jump at this opportunity in a second. I think magazine ads are great. A booth at a trade show lets you interact one-on-one with potential customers. But both are expensive. Also, there’s virtually no limit to the number of magazine ads out there, and Sun ‘n Fun has hundreds of booths. In other words, you’re part of a crowd. It’s hard to stand out. But there’s only one Sun 40 Sprint. It’s never been for sale before, and it could be all yours—all yours. That’s what I call a hot property. Good news race nuts, my Air Racing from the Cockpit series has been picked up by General Aviation News for a second year! The first two installments on now up at GA New’s website, and you can look forward to a new story in every issue starting with the April 6th edition, which is at airports everywhere right now!